One unique project in which the potential of light was fully exploited by ewo as the scenographic staging of the landscape is the illumination of the Spieljochbahn mountain lift in the Zillertal valley of Tyrol, Austria, which was realized in 2017. The nearly four kilometer (2.5 mile) long aerial cable car in the Tux Alps at the western edge of the town of Fügen has been in existence since 1973 and overcomes an elevation change of 1,219 meters (3,999 feet) between the valley terminal and the mountain terminal. 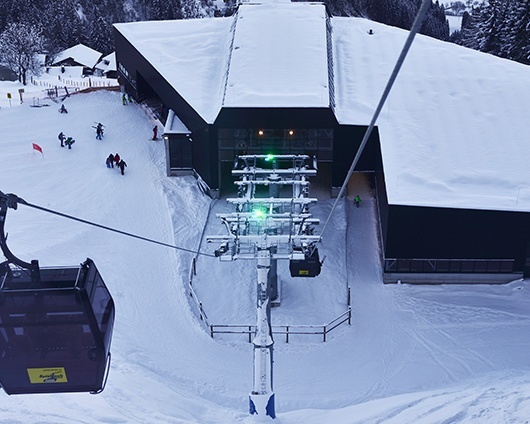 For the 2017-2018 winter season, the cableway was rebuilt by the company Leitner ropeways as a ten-person monocable circulating cableway and, with a capacity of three thousand passengers per hour, has doubled the transport capability of the predecessor cableway. 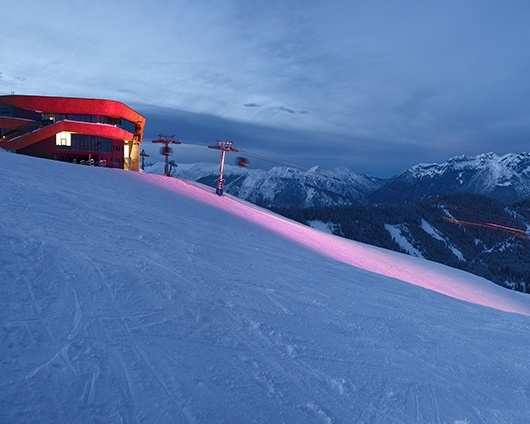 An innovation for which the desire was to show its presence in the Zillertal valley. To do so, ewo, along with lighting designer Klaus Hochschwarzer and Leitner ropeways, worked out a concept which, on top of the emergency lighting, made the route of the lifts radiate in different colors. In this regard, too, new ground was broken with LED illumination. The floodlights from the R System with their modular construction are each equipped with four panels and programmed in the colors red, green, blue, amber, violet, and turquoise, although a simple run of the colors is also possible and can be controlled by the operator either with a laptop or a mobile device. 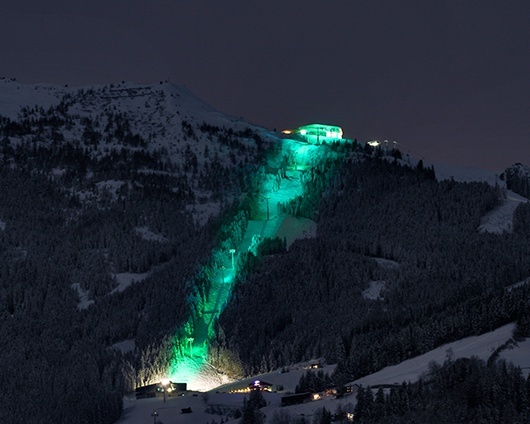 In order to minimize scattering losses and only illuminate the actual lift paths, the lighting was installed with especially tight emission at only eight degrees. Shutters that have been installed avoided undesired glare and provide for additional limiting of the light pattern. An example of how light and color can be used in a structuring manner as extensive landscape elements and can function as an identity marker for an entire region.